MTA partners with Yeshivat Makor Chaim in Israel for an annual exchange program where MTA Sophomores and YMC Juniors spend an academic quarter in each other’s yeshiva. YMC Juniors are currently spending this quarter learning at MTA. In addition to joining the yeshiva’s academic programs, YMC talmidim work closely with faculty to develop and implement initiatives to enhance spiritual programming for MTA students. Last week, they piloted “Blitz”, a new program where YMC talmidim visit each shiur grade-wide to foster thought-provoking discussions on important topics. 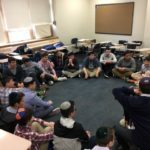 The first Blitz took place in Rabbi Axelrod’s Sophomore shiur and began with an ice-breaker activity followed by a discussion on the importance of Tefillah. Students sat in a circle, while YMC talmidim, Betzalel, Gavriel, Shalom, and Yehuda asked them to think about why it’s important to daven each day and if davening is considered interfering with Hashem’s plans, since oftentimes davening is used as a way to ask Hashem to change things in our lives that we are not satisfied with. Each student was given the opportunity to express their feelings as the YMC talmidim encouraged them to explore their thoughts and opinions. Talmidim summarized the overall lessons they learned from the discussion, including the idea that davening is a way for us to show Hakaras HaTov to Hashem every day and to show Him that we appreciate all that He does for us, as well as the concept that davening is part of Hashem’s plan because Hashem wants us to communicate with Him and to know that He is always here to connect with us. This exercise also showed students the importance of asking questions and that by understanding why Hashem wants us to do things, we can better connect to Him. Students enjoyed engaging in this interactive discussion, which was followed by a kumzits.